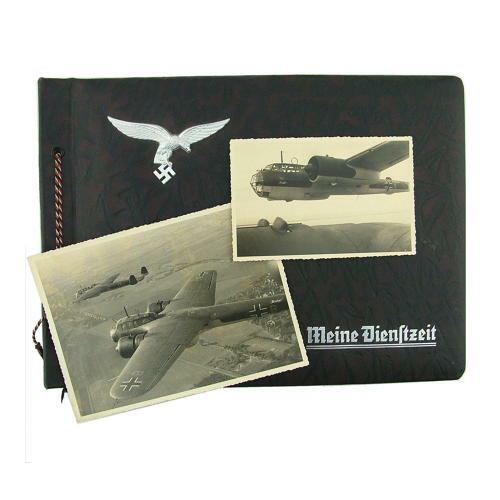 Luftwaffe pilot's photograph album. Approximately 32 x 23cm with a padded faux leather cover embossed in silver 'Meine Dienftzeit' (my service time) and with alloy Luftwaffe eagle attached. It has 24 card pages with greasepaper covers. Most pages have photographs on both sides (48 sides plus inner rear page, 49 sides in total). There are a total of 194 photographs varying in size from small snapshots approximately 5 x 6cm to the largest at approximately 18 x 13cm. The majority are about 9 x 6cm in size but use the photo corner mounts to gauge size as they are the same throughout the album. The photographs show the album's owner in various situations - in uniform and flying clothing. These include photographs at his barracks, training/marching, rifle-practice, group shots, parades, with relatives, on the aerodrome, flight training etc. His squadron appear to have operated on Dornier 17 aircraft and there are lots of photos of these on the ground, air to air, inside the cockpit etc. There are some great photos showing period flying clothing and a few of Hermann Goring inspecting his squadron. All the pictures are in good condition and can be removed (attached via corner mounts). A really good album with excellent content. Further research may reveal the unit in question. Stock code P22284.